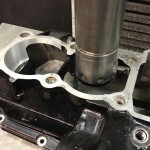 Following fitment of oversize cylinder liners as part of a “big bore conversion” it may be necessary to enlarge the diameter of the crankcase mouth to accept these. At H T Howard we carry out this operation using our BERCO AC650M boring machine. For crankcases which are split horizontally and which have vertically mounted cylinder barrels the crankcase can be mounted utilising the machine parallels, however in some cases the crankcase upper half and cylinder barrel are not at right angles to each other which means that the cylinder barrels do not sit vertically on their cases. In this case our dedicated roll-over fixture is used and the crankcase must be set up using the same method as for angled cylinder barrels. 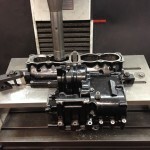 Whichever method is used, once mounted the liner aperture in the crankcase mouth is clocked up and machined bored using the same methods and equipment used for the re-boring processes. Motorcycle crankcase mounted on roll-over fixture for machining to accept oversize liners. 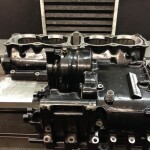 Where large oversize liners have been installed the crankcase mouth may need enlarging. 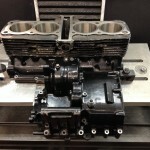 After machining, the cylinder barrel is test fitted to the crankcases to ensure the alignment is perfect.